If you need more incentive to make David Chang’s Ramen Broth (or my version thereof), his Shrimp & Grits ought to be enough. I save the “Grub” category for special occasions, mainly those times when I’m in danger of licking the plate. Using the ramen broth adds two sub-basements to this structure. The flavor goes deep. And I’ll say it again: this recipe is all about umami. I could eat this once a week. But I won’t. Shadowcook: I order Anson Mills grits, but they did not arrive in time. The grits I used — Moore’s Flour Mill grits — compare unfavorably with those of Anson Mills, at least according to two grits experts, friends from South Carolina. Well, the grits I made were pretty good anyway. I’ll be curious to taste the difference. Shadowcook: Given how I adapted the ramen broth recipe and omitted taré, I used regular soy sauce. Shadowcook: Wary of adding more smoked flavor, I used guanciale, which added a surprising sweet note that comes soaring over the top. 1. Soak the grits in the water overnight or at least 8 hours in the pot you’ll cook them in. 3. Add the soy sauce, a large pinch of salt, and a few turns of black pepper. Keep the heat low and whisk regularly if not constantly; the grits should be thickening, undulating, and letting occasional gasps of steam bubble up and out. Soaked grits will be cooked after about 10 minutes over low heat; unsoaked grits will take 20-25 minutes. They’re ready when they’re no longer grainy, when they’re thick and unctuous. Shadowcook: I think it generally takes longer. When I soak the grits, I cooked them for 30 minutes. They were deliciously creamy. 5. Cook the bacon: Heat a skillet over medium heat for a minute or so, until very warm. Add the bacon and cook, stirring occasionally, until it shrinks to about half its original size and is crisp and browned, 5 to 6 minutes. Remove the bacon with a slotted spoon and drain it on paper towels. Drain the bacon fat from the pan and return the pan to the stove. 6. Put the shrimp in a mixing bowl, pour the grapeseed oil over them, and add a couple of large pinches of salt. Toss them in the oil and salt until they’re coated. Wipe the pan cleanish with a paper towel and turn the heat up to high. Cook the shrimp, in batches if the shrimp will crowd your pan, which is probably the case. As soon as the shrimp hit the pan, press down on them, using a bacon press or the back of a spatula, or a smaller pan or whatever works, and sear them for 1 to 2 minutes on the first side. Shadowcook: A bit fussy, that. Just make sure not to overcook them. Sear them but do not overcook them. So, pay attention to the following. 8. 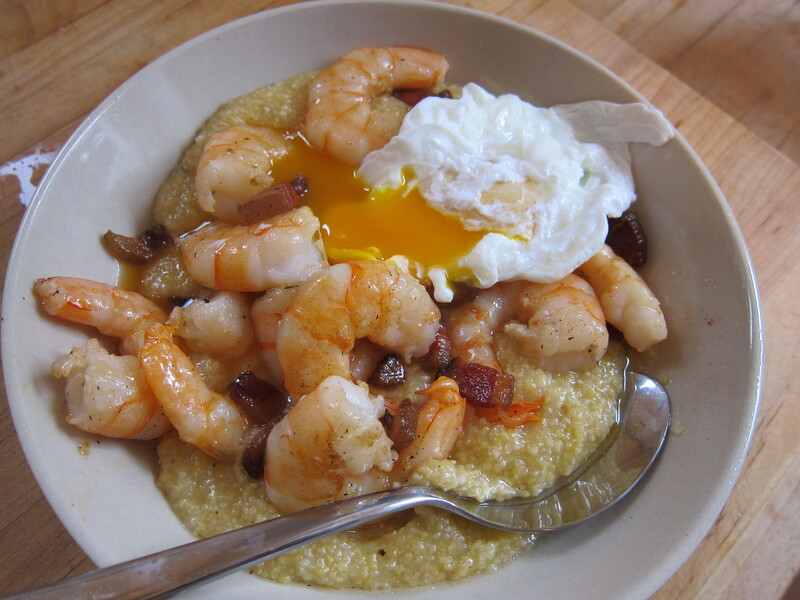 Make up plates for everybody: start with a big helping of grits, nestle a poached egg in the middle of the dish, and arrange some of the bacon and shrimp in separate piles and then some sliced scallions in another. Serve at once.